In August I went up to the Edinburgh fringe festival, it had been five years since I was last there as a performer and I was desperate to return. I also wanted to see work at the Forest Fringe venue but was sad to see they were not hosting one this year, instead they were publishing a book Paper Stages from which there would be pages of provocations for the reader to perform. I liked the idea of this, even more so, I liked the idea of receiving the book by doing one hours work at the Hunt and Darton cafe, so, I set out to find said cafe. As you can see from the picture not so easy, with the scaffolding creating an extra layer from the street, but as I walked past, it was not the piles of Paper Stages books in the window or even the fact that it looked like a cafe, but some newpapers in the second window that made me look twice. 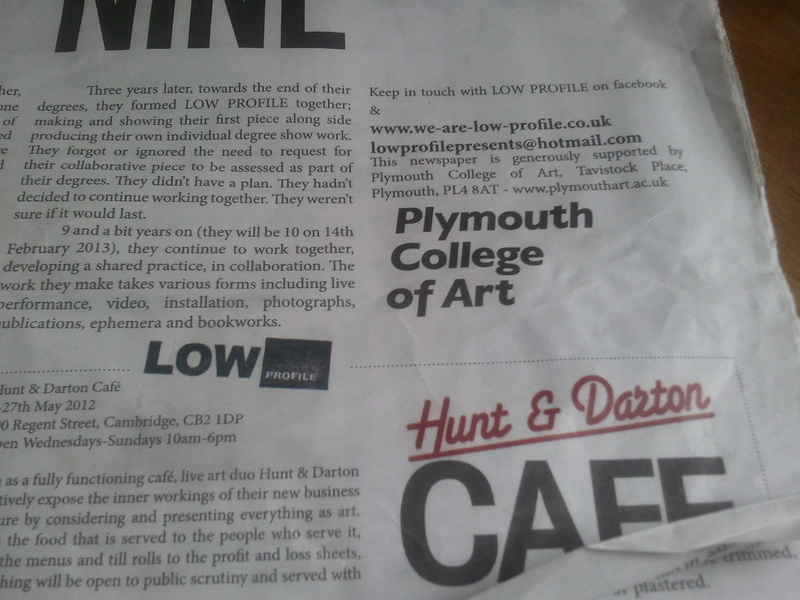 There in black and white was the name of the city, where I live, in a cafe geographically hundreds of miles away – this is what made me stop in my tracks, the word Plymouth and then, when I looked closer, I saw the words Hunt and Darton Cafe. 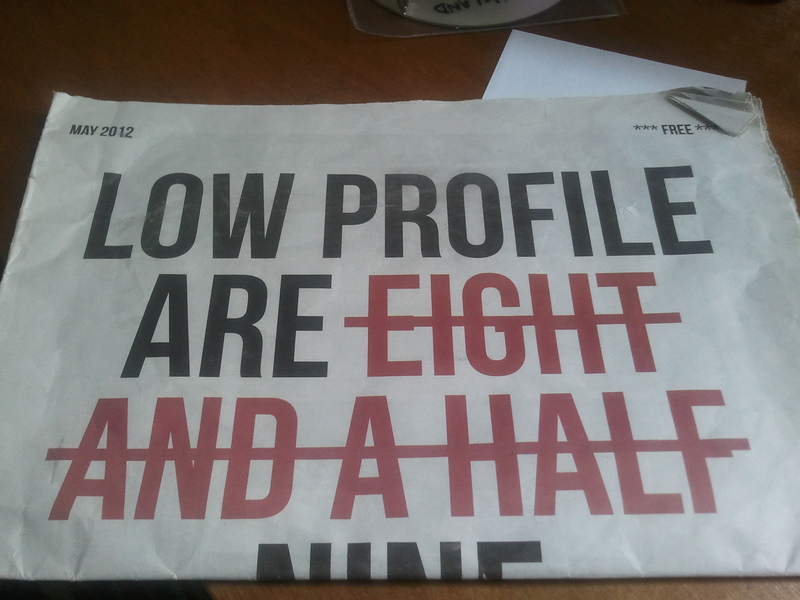 I was really surprised to find a newspaper written by Plymouth based company Low Profile staring me in the face, but as a creature who believes in fate I felt it was a sign, so I went in, collected my copy of Low Profile’s newspaper and signed up for my one hour of work. I fully expected to be waiting tables or washing up but was more than happy when I was told to go and gather more things for the cafe, glasses, nice mugs, vinyl LP’s and teapots – all with a retro feel if possible. 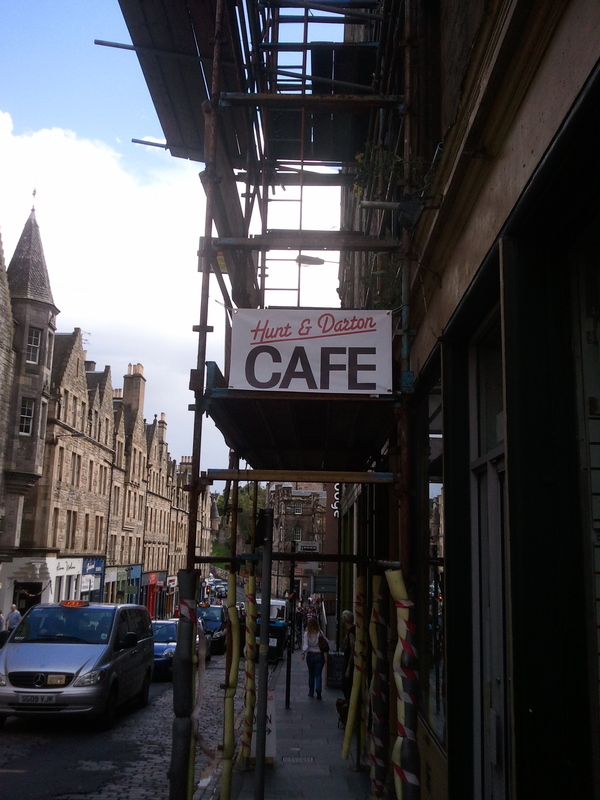 So for the next hour I trawled the charity shops of Edinburgh around the Royal Mile to collect my shopping list – happy to say I found everything and returned it to the cafe in return for my book. Since my return to Plymouth I’ve been looking at the Low Profile newspaper and saw that they want people to feed back to them if they had encountered their work. Looking through the paper I recognised the badges that were on sale in the B Bar at the Barbican Theatre, I remember they made me laugh especially the one that said PLYMOUTH NOT PORTSMOUTH. When we first moved down here 12 years ago my best friend drove down from London for the weekend and phoned to say “I’m just arriving in Portsmouth now, where do I go?” Of course I also saw the ‘survival shelf’ at the Hunt and Darton Cafe which made me smile and I was intrigued by the titles of the books. I think I only realised it was made by Low Profile when I saw the picture of it in the newspaper, but that was probably my bad eyesight (remember I didn’t spot the cafe even though there was a large sign on the scaffolding). I may even have some books that could be added to the shelf. As instructed I am sending you this link for your response blog Have-You-Seen-Our-Work and hopefully I will now engage with your work in Plymouth rather than hundreds of miles away. This entry was posted in Festival, Uncategorized and tagged B Bar, Barbican Theatre, Hunt and Darton, Low Profile, Paper Stages on November 7, 2012 by Ruth.